Picture is from the Pine Island Nursery web. This is a variety grown in California. When compared to Hass, fruit quality is not good, lower oil content than Hass, and even though Bacon trees are sold at Big Box stores to home owners, it is considered a second rate Avocado for California. Fruit matures September - October in So Florida, no big deal, a lot of good So. Florida fruit around at the time. I do not know anyone that owns one tree, or found a lot of information on line regarding local culture so I got a 5 gal. tree last year and planted it in the spring 2011. I will report on the progress of this variety growing in Homestead Florida. If it is worth keeping or if it will be a candidate for early top working. August 23, 2012: Something went wrong. Today I saw the tree, It looked bad and I got close and saw the fruit the tree was holding was wrinkle, dehydrated and some were soft but hanging on the tree. I was disappointed to say the list. I should have know better. I removed all the fruit that this little tree was holding, 14 avocados. That stress from so much fruit and the recent heat may have cause the problem, Now I have to recover the tree if it survives and wait for next year to taste the fruit. See video right bottom. Also you can see the difference in the center photo taken in March and the right photo taken in August. Big difference. March 22, 2013: The tree has recovered, looks weak, has not flower this year, so it may recover. June 22, 2013: The tree seems to be recovering well. Did not flower this year. 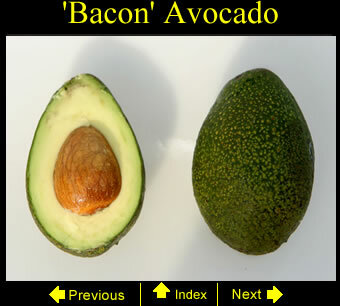 November 1, 2013: was able to try a Dade County grown Bacon Avocado. It was a 10 oz fruit with very good looks, It even felt creamy. First the taste was not to my likening, very bland, tasteless. Second did not mature evenly some section were harder than others. My tree has not produced any fruit and seems to be slowly recovering from a near death experience. I'm not sure if there is a future for this tree in my program. These are the complains I hear from some of these California fruit growing in So. Florida. January 28, 2014: The tree has recovered as the picture shown. It looks like is building Flower Buds. I will probably leave just 2-3 fruits is any sets this year. This tree should be 2-3 times it current size had not been for the near death event. March 1, 2014: The tree is flowering nicely. Seems to be fully recovered. June 1, 2014: I did notice some fruit set about a months ago but dropped them all. Some times takes a few years from trees to recover from these near death experiences. September 22, 2014: I picked the first Bacon from my tree. Nice specimen 11 oz. Let's see if it matures evenly with better taste than the one I tried last year grown by other. 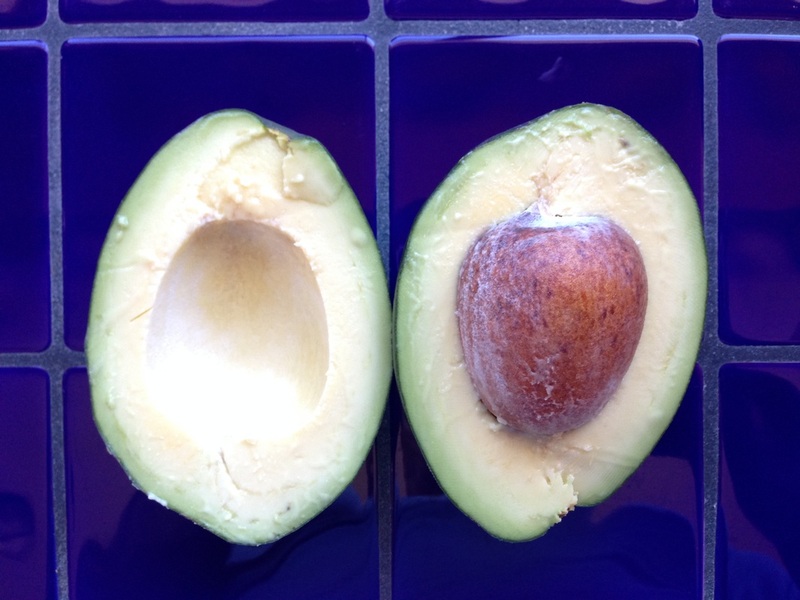 October 18,2014: In a recent meeting the Dr. David Kuhn USDA reported on USDA mapping of the avocado genome. He mentioned Bacon is not pure Mexican race but is a hybrid with Guatemalan. March 9, 2015: The tree appears recovered and ready to bloom again. Seems like a small tree. May 30, 2015: The Bacon tree still small. I'm not sure if it had fully recovered from the near death experience of the summer of 2012. Only 3-4 fruit on the tree. May be it would hold them to maturity. To the right is the Yamagata tree to the left the Mexicola. October 25, 2015: The tree held a few fruit. Some fell off with disease. Today I tasted a fruit picked about 5 days ago, Watery, no flavor, Some stem rot sending fibers into the fruit, as today pictures show. This is the second time I taste this fruit and I do not see a reason to grow this tree in So. Florida. See today's pictures.